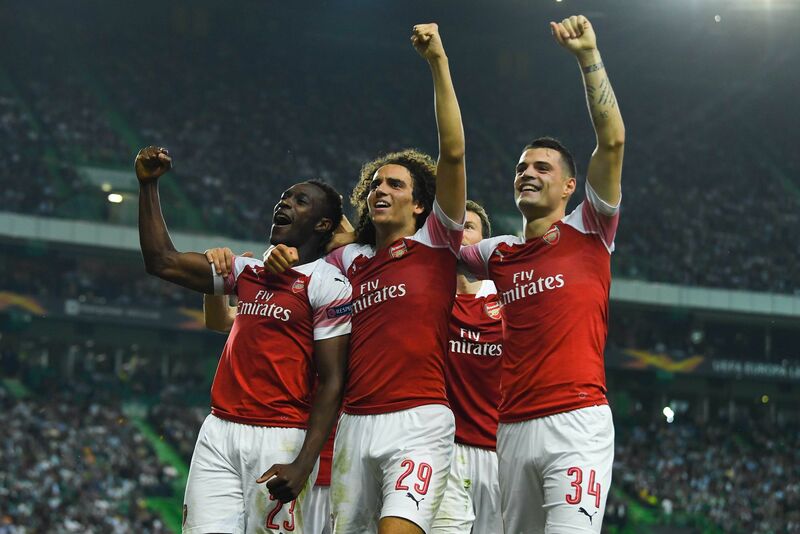 Arsenal supporters turning up for Thursday night Europa League football were hoping for some excitement to warm them up and also for outright group victory with a win and three points. Things didn’t really turn out like that. The best chance I can remember was when Douzi played a sweet one-two down the right and Welbz just failed to make decent contact at the near post with the Frenchman’s fizzing cross. After half an hour Danny seemed to catch his foot in the turf trying to make good contact with a header. You could tell he was hurt by his reaction and by the reaction of those around him. So sad. He was having a fine season getting both game time and goals. Get well soon, Danny. The Arsenal players were obviously deeply affected by their very popular and likeable teammate having such bad luck. Auba had a few chances he might have gobbled up on a different day. Micki got into a great position and then couldn’t quite divert Wobbly’s driven cross beyond the Sporting keeper. Lichtsteiner pinged a hammy by the look of it so efforts to preserve the fitness of the Wardrobe had to be foregone after the hour mark, but he seemed to come through unscathed. Hopefully Nacho will be match fit soon as well. We had 14 efforts on goal, 5 on target, Sporting had five shots, none on target. A point was good enough for them and that’s what they came for. This clip sums up Arsenal’s night in front of goal……. The game was overshadowed by Danny’s injury. The foul count was Arsenal 7 Sporting 13. Lisbon’s 13 should have been a whole lot more. Acuna, playing on the left with no neck and the gait of a simian should have been sent of several times before Mathieu’s professional foul finally saw one of them leave the pitch. Unfortunately it came too late to have any effect on the result. I realise that the ‘Sporting’ in the Portuguese club’s name doesn’t mean the same as it did for the Sporting Corinthians but they employed every destructive and negative ploy they could to disrupt the football match, including studs down the back of calf muscles, a wide variety of trips and the use of an arm. Nani should be sent off every time he steps on to the pitch just for his loathsome ‘5 year old having a tantrum’ face. Our unbeaten run extends to 15 games, so let’s make it 16 by beating Wolves on Sunday for Dat Guy. Win tonight. Top the group with two easier games to go. Job done. Perhaps the post should stop here! Man Utd and Spurs completely undeserved victory will hopefully keep them out of the Europa. There seems to be heightened expectations that we will win this tournament but, like the Carabao, it is relatively easy until the final rounds. Sporting Lisbon have not kept a clean sheet in any of their last 30 European games, I expect that run to continue. Having said that, we have not kept a clean sheet in our last 5 European games! We have discussed Sporting in the first leg and we have little to add. They are a decent team, strong defensively, hard working … the usual. We should beat them in a home tie. We have injuries and players returning to the squad, they should remain out of the team. A mixture of youth and experience is what is required. A strong attacking bench will allow Mr Emery to play a very inexperienced and young midfield. I very much doubt he will play this team but it would be fun. Xhaka needs a rest, and I would keep Iwobi for Wolves at the weekend, same with Laca, Hector, Terrier and PEA. Tonight’s 6 officials (referee, linesman, behind the goal-line linesmen and 4th official) are from Lithuania, could this be a first? Not as easy a fixture as many are assuming, this will not be a walkover. If Unai Emery’s Arsenal were a snake, what snake would they be? What I mean is, if you had to compare Arsenal’s style of play or, let’s say, their game plan with a snake which snake comes to mind? It struck me as I was watching Arsenal beat Sporting to make it eleven wins on the trot that a clear pattern is emerging. We start games perfectly well then after about twenty minutes we start making silly mistakes; in the hope of capitalising on said mistakes the opposition are drawn further up the pitch and into the trap. What they don’t realise is that they have become caught in the snake’s coils and they are slowly closing; yes the opposition flail around for forty five minutes or so, they may even score a goal but as the second half moves on the coils start getting tighter and tighter, slowly squeezing the life out of them. The snake has surely got to be a Boa Constrictor. Well, you try and find a way of starting our eleventh win on the bounce “Ozil benched after pedestrian performance” lol. There are two teams starting to appear, the one that starts the EPL and the one that starts the Europa, did you imagine at the beginning of the season that Iwobi could find himself being saved for the EPL? Me neither but it certainly is testament as to how far Unai has been able to bring him on this season. With only a slim advantage of one nil, I even found myself feeling relieved when he made his appearance. Strange times. The other thing that surprised me during the game, was going from feeling quite neutral about little ol’ Sporting with their nice food and pleasant weather to absolutely hating their guts for their dirty fouls and their dirty play acting. This was made all the worse when I realised that the ex manu player Nani was playing for them – once a banned ‘C’ word, always a banned ‘C’ word. It obviously wasn’t a vintage Emery display (lol), no hope long range shots in the first half; the order made all the more tall with Xhaka and Lichtsteiner as makeweights on the flanks but we did what we do nowadays and found a solution, after a good opportunity was missed by Aubameyang and things looked like they might not go for us, Ralph Coates made a schoolboy error that gifted Welbeck a deserved goal which turned out to be a deserved winner. Sporting Lisbon. Ramsey to Shine? Cristiano Ronaldo, Nani, Quaresma, William Carvalho, Luis Figo, Peter Schmeichel, Phil Babb (! ), All played for Sporting and, had they still been in the green and white shirt, this evening would be very difficult but they don’t. In fact, Sporting Lisbon had a player revolt in summer which resulted in players cancelling their contracts and leaving the club. 7 players left including 4 Portuguese internationals, and all left on a free transfer. And we think players in the PL have too much power! Without too much research this happened because Sporting got a new Chairman who created a poisonous atmosphere within the club, they then went on a losing run resulting in some fans attacking the players on the training pitch, giving the players the right to cancel their contracts. Needless to say, this has weakened the team and this season they sit in 5th place in the Primera Liga. 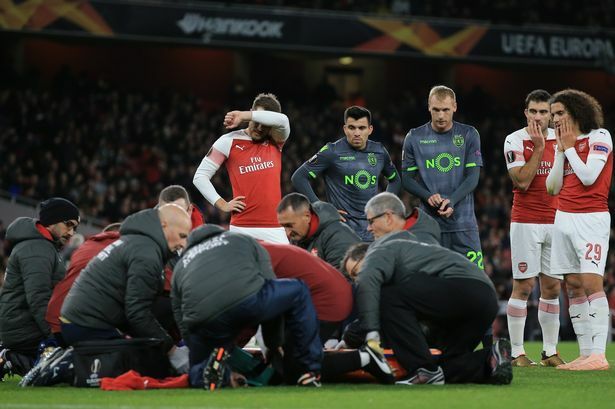 We come into this game in tremendous form and, despite a mounting injury list, Emery is certain to play around with his squad and we may well see Smith Rowe or even Elneny in midfield. Both AMN (Cons) and, believe it or not, Carl Jenkinson are travelling with the squad and must therefore be available. I really like Jenks – not as a player for Arsenal but as a proper Gooner. I wish him well and perhaps he will get a start in the Carabao. Maitland-Niles (Cons) has a big future at Arsenal and may well get some pitch time this evening. Ramsey was poor in his 10 minutes at the weekend, he needs to up his game and I expect him to do so. A wonderful goal apart, he has struggled, but he remains a very influential player. Tonight he will want to show Emery he is deserving of a first team shirt. Watching Emery’s press conference yesterday I was delighted that when questioned in Portuguese, Unai understood the question and then answered in English. This shows his commitment and also his intelligence. Tricky away fixture (we have never won in Portugal), if we draw this and win the home tie we will top the group. but we have a very food squad in good form and there is no reason why we cannot win tonight in Lisbon then celebrate with a bowl of Sopa de Cacao. Sporting Clube de Portugal – Who are ya? Sporting Clube de Portugal was founded in 1906 and is most famous for its football team. Part of the big three Portuguese clubs along with Benfica and Porto, they’ve never been relegated from the top flight in Portugal and have won the third most trophies, 48 including 18 League titles. They also won the European Cup Winners Cup back in 1964. 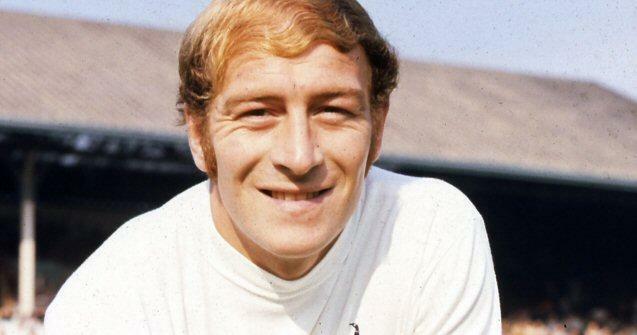 We’ve played them twice before in the 1969/70 Fairs Cup, drawing 0-0 away and winning 3-0 at Highbury. 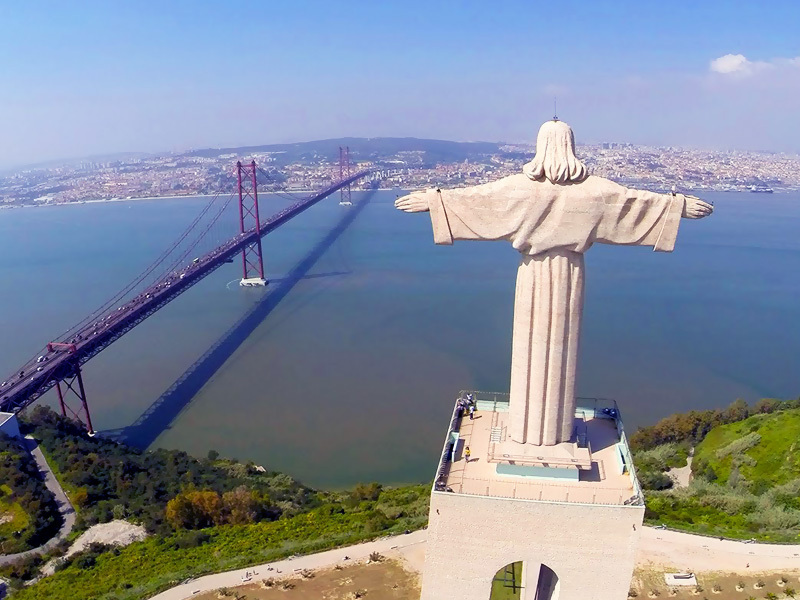 Lisbon is by all accounts a beautiful city with the Statue of Christ the King overlooking the Tagus. 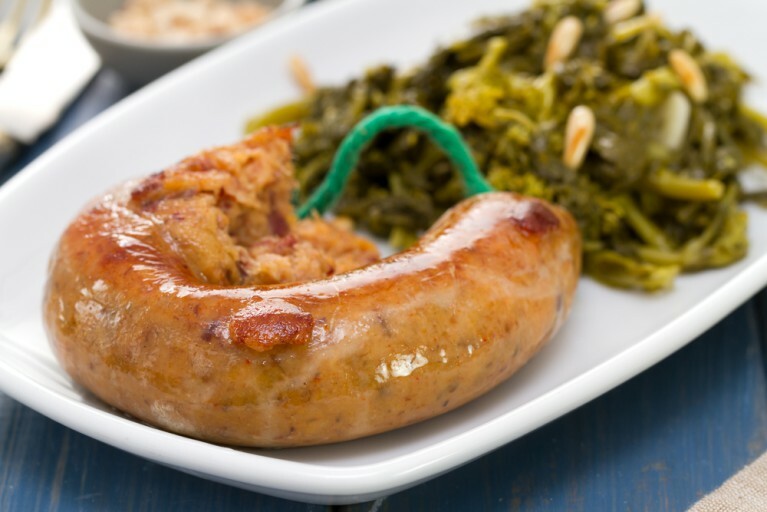 The alheira, a type of fowl sausage, is one of the cheapest and most common Portuguese dishes with a fascinating history. When the Jewish population was expelled from Portugal in 1498, many hid in the mountainous region of Trás-os-Montes in the northeast of Portugal, practising their religion in secret while pretending they had converted to Catholicism. One way to do this was to ostensibly make, display and eat sausages so that everyone would think they were no longer keeping kosher. Nowadays, the dish is available in any corner eatery. Aveiro, located between Porto and Coimbra, is famous for its eels which are most often eaten simply fried or in a soup. Fishermen at Murtosa and Torreira (not Lucas!) 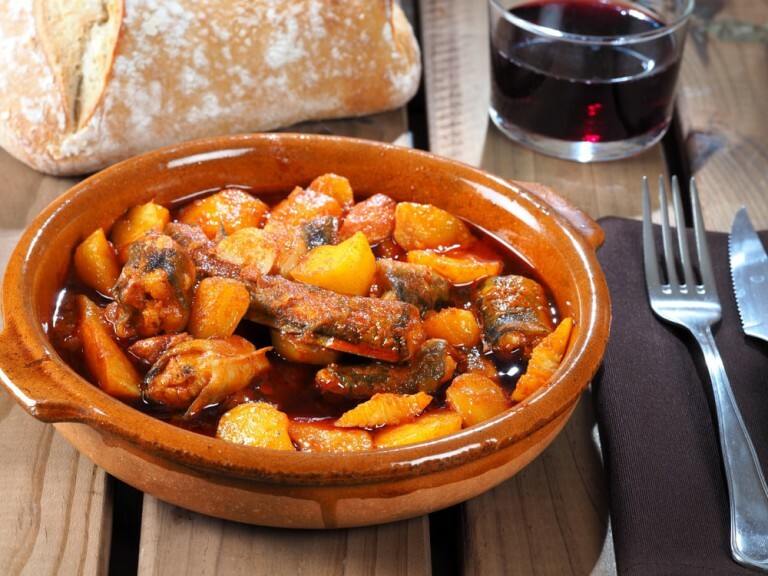 beaches, just outside Aveiro, make an eel stew seasoned with saffron and accompanied by bell peppers, combining beautifully with the crisp white wines of the Bairrada region, just south of Aveiro. 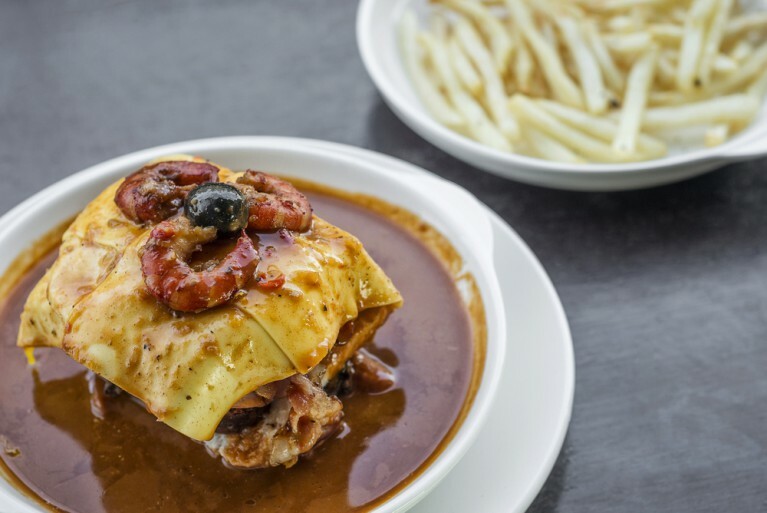 The signature dish of Porto, the francesinha is not a meal for the fainthearted. The dish comprises of two slices of bread interspersed by steak, ham, sausage and chorizo, covered in melted Edam and drizzled in a secret, spicy, tomato based sauce, all served with chips and optionally crowned with a fried egg. While tubarão is the common word for shark in Portuguese, once it reaches your table it becomes cação. 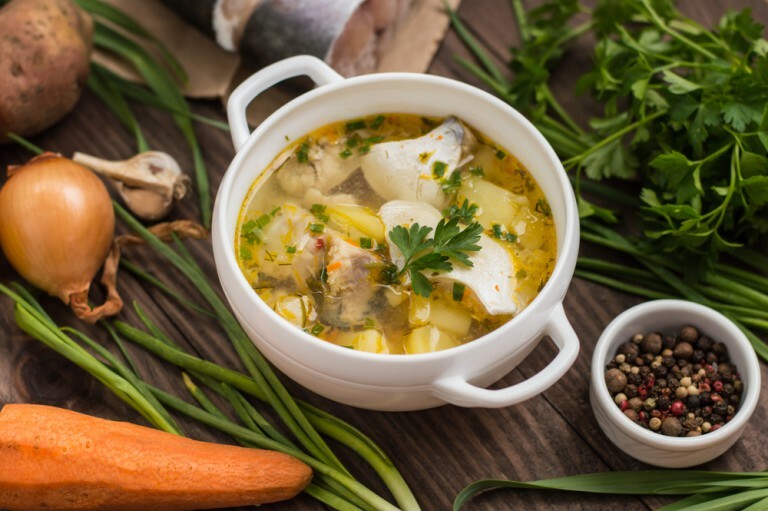 The fish is marinated in coriander, lemon and garlic before being brought to the boil and the soup is commonly eaten with bread, particularly a corn-flour type known as broa.